As the weather changes from winter (Vata season) to spring (Kapha season) you may notice changes in your mind and body. During the wet and cool Kapha season, which lasts from March to June, you may feel the onset of spring fever or the need to take more exercise—and you also may be more likely to catch a cold or flu. Favor foods that with the following tastes: astringent (such as beans), spicy (chili peppers or curry powder, for example) and bitter (bitter greens and spinach). While you may find yourself tempted to start eatting more salads, be careful about avoiding cold foods. Early to bed, early to rise. As Kapha season progresses, the sun rises earlier and earlier. If we are constantly waking up after the sun rises, we will feel sluggish and tired. This habit can result in the build-up of impurities (ama) which predisposes us to allergies and congestion. Try to exercise in every morning. Getting some good, brisk exercise during the Kapha time of the morning (6:00 – 10:00) will help you maintain a healthy balance during this wet and cold season. Just as sleep is the number one took in balancing Vata, and diet the number one tool in balancing Pitta, exercise is the number one tool for balancing Kapha. Barley is an ancient grain first cultivated in the Fertile Crescant area of West Asia and in Tibet. Not only is barley the best grain for balancing Kapha dosha, it is also beneficial for Pitta-types as well. Mildly astringent, barley has a slightly drying effect, is diuretic in nature (helping to clear fluids from the body) and can help improve sluggish digestion. 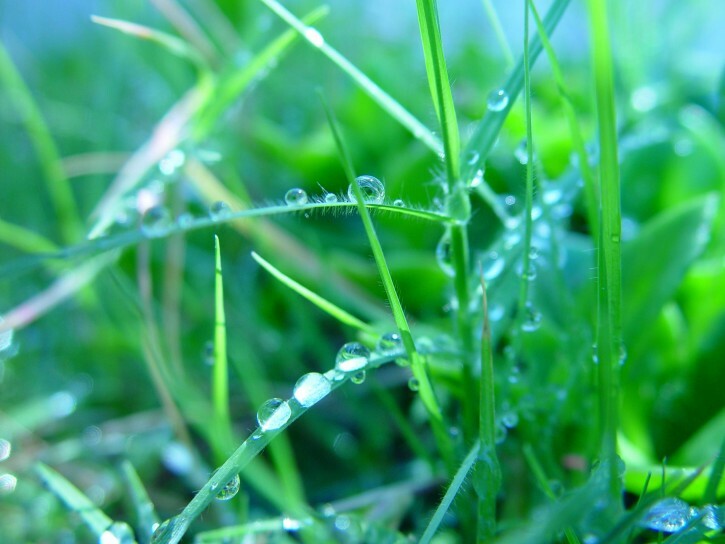 Ayurveda recommends organic, raw barley as opposed to pearl barley. Barley is considered one of the “good” carbohydrates because it is high in soluble fiber content and is slow to digest, thus reducing spikes in blood sugar levels after a meal. As with many high fiber foods, barley helps to increase the release of bile from the liver and gall bladder, aiding fat metabolism. High fiber foods also tend to appease the appetite longer, eliminating the urge to snack after a meal. 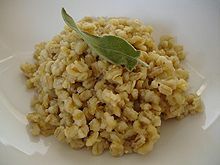 Barley helps soothes irritated, inflamed bowels and its fiber has been shown to repair the intestinal lining. Barley (along with whole-grain wheat, and rye) contains alkylresorcinols, a phytochemical that is an active antioxidant. Research suggests these grains have a protective effect against diabetes and ischeaemic stroke, as well as having anti-carcinogenic effects. There are also indicators that these grains work as natural regulators of excessive fat accumulation. Barley water is effective in balancing weight and supporting healthy kidney functioning. Below the barley soup recipe you’ll find a recipe for barley water. With the advent of spring, those with Kapha imbalances and those who have gained weight over the winter may want to reduce their intake of rice and wheat and start including more barley in their diet. Saute the parsley, rosemary, basil, oregano, thyme, celery and carrot in the ghee slowly for 10 minutes. Add the vegetables to the stock. Add the barley, turnip and bay leaf. Bring to a boil. Cover and reduce heat. Simmer for 1 and 1/2 to 2 hours. Season to taste with salt and pepper. This recipe makes about 6 cups of soup. Ayurveda cautions us to be especially alert during seasonal transitions because the body functions differently in each season. This is especially true in the transition from winter to spring—from Vata season to Kapha season. Late winter marks the transition time from Vata to Kapha. The frigid temperatures of January and February are behind us, the days are lengthening, giving more time for the sun to warm the earth, and nature is beginning to wake up. As the temperatures rise, melting snow and ice, our environment and our physiology shift into a different mode of functioning. Moving from “hibernation mode” during which our bodies tend to store fat and crave heavier, Vata-pacifying foods, the body now begins to melt accumulated fat. If we have accumulated ama during the earlier months of winter, these toxins start getting released into the body’s micro-channels. This flood of toxins can compromise our immunity, opening the door to colds and flues. This excess of ama can also create joint problems and lead to sinus problems, asthma, bronchial infections, allergies and hay fever. In addition to the build-up of ama, as the cold, wet qualities of Kapha increase in our environment, they also increase in our body. Kapha is what our body is made out of — our bodily fluids and our muscles, fat and bone. The main seat of Kapha is located in the chest, but we also find Kapha in the throat, sinuses, nose, stomach, joints, plasma, and also in secretions of the body, like mucus. Mucus has its function in protecting important tissue in the body. But an excess of mucus can lead to colds and other disorders. Because childhood is the Kapha time of life, during this season children may be especially vulnerable to producing excess mucus and experiencing upper respiratory illnesses. 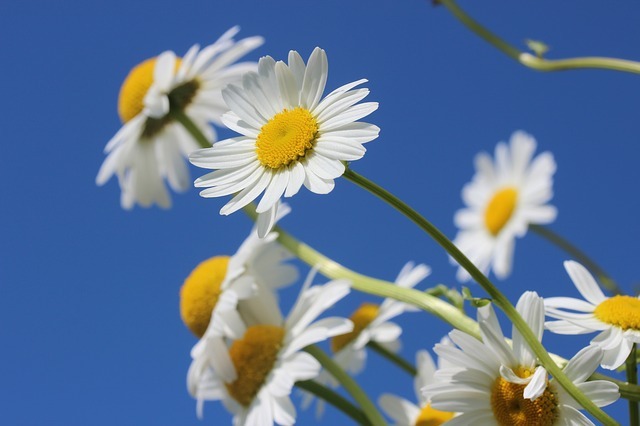 You can see why spring in a traditional time for cleansing and detoxing. The body is already in a natural detox mode and often needs our support. Generally try to favor Kapha-pacifying foods such as bitter greens, beans and dals, and fruits such as apples, pomegranates. Continue to eat warm foods, but opt for lighter foods such as soups. Switch to grains such as barely, quinoa, couscous and millet. Avoid cold drinks and food, processed foods, fried foods, and heavy foods such as red meat and dairy. Adding pungent spices to your food will help increase your agni, or digestive fire, and help eliminate mucus and phlegm. Enjoy black pepper, cayenne, cinnamon, clove, and ginger. 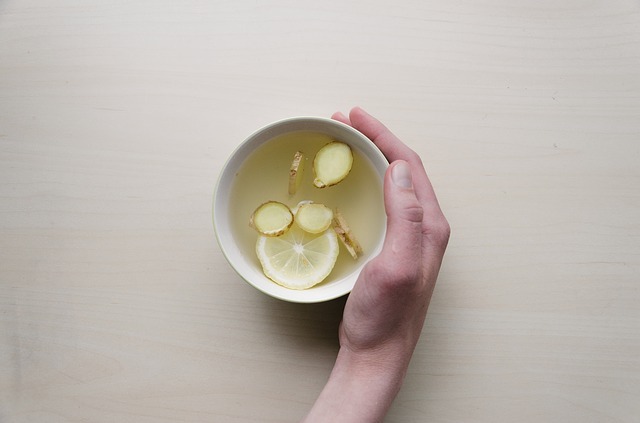 Try drinking ginger tea to help enliven your digestive fires. Also a glass of lukewarm water with ½ tsp of unheated honey first thing in the morning is a good combination. It not only helps warm the body but also digests all the toxins. Exercise: One of the best ways to balance Kapha is to get exercise. Breaking a sweat by going for a brisk walk, run, or even using Swedna, or steam bath, can help relieve congestion and increase circulation. It’s important to choose the right exercise for your body type. 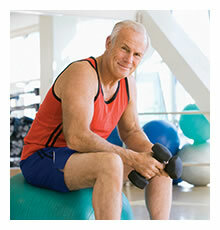 If you have not been exercising regularly throughout the winter, start gently so as not to strain the physiology. Brisk daily walks and yoga postures are good for Vata types. More vigorous daily exercise is helpful for Kapha. Working up a sweat is during Kapha season, because it helps to boost agni, increase circulation and relieve congestion. Oil Massage: Start the morning with an oil-massage followed by a warm bath. This will help to open the pores, and regulate your body’s internal thermostat. This is helpful in both Vata and Kapha season. Panchakarma: This is also a great time for Panchakarma — the traditional purification treatments of Ayurveda. Panchakarma includes a full program of Ayurvedic massage, steam and heat treatments, and intestinal cleansing treatments, to rid your body of ama accumulated during the previous season. Panchakarma also helps to strengthen your agni, or digestive fire, in order to help prevent a build-up of ama in the future. These days there is no disputing the fact that exercise plays an important role in supporting both our physical and mental health. Exercise increases circulation and helps remove toxins and impurities (called “ama”) that have accumulated in the physiology. These deposits are a major factor in the breakdown of the resistance of the body. Exercise is a key procedure for helping the body’s natural internal cleansing process. Exercise also helps increase mind-body coordination. According to Ayurveda, disease and disorders occur when the body loses contact with the underlying intelligence responsible for its maintenance and repair. Exercise involves the coordinated activity of body and mind and is a valuable aid in maintaining and enlivening the connection between the physiology and its underlying biological intelligence. Ayurveda recommends exercising to 50% of capacity. Fifty percent capacity can be recognized when strain begins to appear in the body. You can tell if you are straining when breathing through the nose is no longer easy, when sweat begins to appear on the forehead or nose, and when it becomes difficult to maintain proper form and focus during exercise. Exercise should energize the physiology, leaving it feeling exhilarated and ready for work. Exercise should never exhaust the physiology, requiring extra rest for it to repair itself. When you reach a point of strain, don’t try to “push through”. Your body is letting you know that it is time to stop. Over-exercising turns on the body’s “fight or flight” systems, depleting the body’s reserves—exactly the opposite of the goal of exercise. This caution is especially important for Vata types and for most body types during the Vata time of the year. Vata types have the quality of motion and changeability highly enlivened in their physiology. They need less exercise than the other major body types. They generally have more slender frames and less strong joints, and cannot take the pounding of heavy, extended exercise. Exercising excessively during the cold, dry, windy days of Vata season will increase Vata in all body types. This can make one more susceptible to colds and flues. On the other hand, the harsh, cold temperatures of winter can discourage exercise and lead to months of sedentary habits. A complete lack of exercise—often accompanies by poor eating habits—can lead to an accumulation of toxins and to weight gain. While this may provide a feeling of comfort during winter, the price is paid in the spring when the release of built-up of toxins in the body can lead to allergies, spring colds, and asthma. Committing to a regular, moderate and blissful exercise routine in the winter will help maintain balanced health throughout both the winter and spring seasons. Once the wet, Kapha days of spring arrive, you can begin to increase your exercise routine, especially if you are Kapha by nature. Kapha types have an inherent tendency toward heaviness, and as a result need significant quantities of exercise. Because Kapha types have strong frames and joints, they can more easily withstand vigorous and extended exercise.